Survivors of sexual violence will have access to additional counselling, police and court support, and crisis assistance in more communities. Ministers McLean and Sabir announce an increase in funding to AASAS to support survivors of sexual violence. 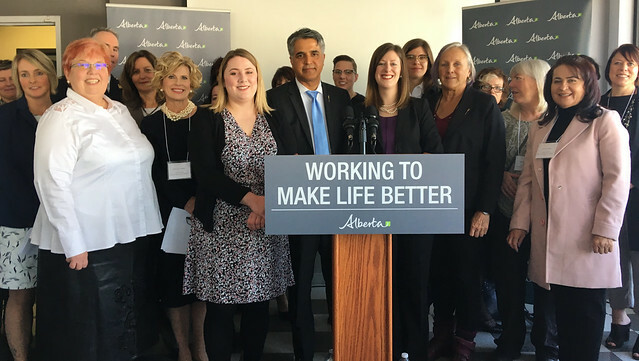 The province is expanding front-line services across Alberta with an $8.1-million investment in the Association of Alberta Sexual Assault Services (AASAS), to ensure survivors who take the brave step to come forward have the supports they need. Sexual assault centres and law enforcement are reporting increased demand for counselling services. The government-funded #IBelieveYou campaign against the backdrop of the global #MeToo movement, are starting to help survivors feel safe about reaching out for help. AASAS will use the money for ongoing funding of front-line services, including expanding crisis response and greater use of specialized police and court support workers. The funding is from Community and Social Services, Health, and Justice and Solicitor General. AASAS will also hire more staff in seven under-served communities so survivors in those regions get the support they need close to home. The funding is additional to the almost $44 million invested since 2015 to support a wide range of programs and services to prevent sexual violence and support survivors in communities across Alberta. Sexual violence refers to any violence, physical or psychological, carried out through sexual means or by targeting sexuality. Government works across ten ministries with agencies and community organizations across the province to prevent sexual violence, support survivors and ensure the social, justice, health and educational systems respond to survivors. $750,000 from Health for specialized counselling and expanded services. $1.09 million from Justice and Solicitor General to enhance police and court support services. Sexual violence is one of the most under-reported crimes in Canada. Of reported cases, 87 per cent of victims are women and 94 per cent of assailants are men. Government increased access to the legal system for survivors of family and sexual violence by removing the time limit to bring forward civil claims. Government has funded AASAS’s #IBelieveYou campaign, with $800,000 invested over three years, to support survivors so that when they come forward, they are treated with respect and dignity, and not subjected to myths and stereotypes.